When it comes to upgrades on stock bikes, everyone is looking for the most bang for the buck but seems to hesitate on wheel upgrades. Maybe it’s because of the elevated price points over simple stem and bar swaps, or maybe it’s the plethora of options. We decided to take a look at three different carbon clinchers that have similar profiles but with different features and different price points to help guide you to the next upgrade. The Bontrager Aeolus Pro 3 is a new wheel that, unlike Bontrager’s high-end, American-made offerings, is made in Asia for a less expensive price. 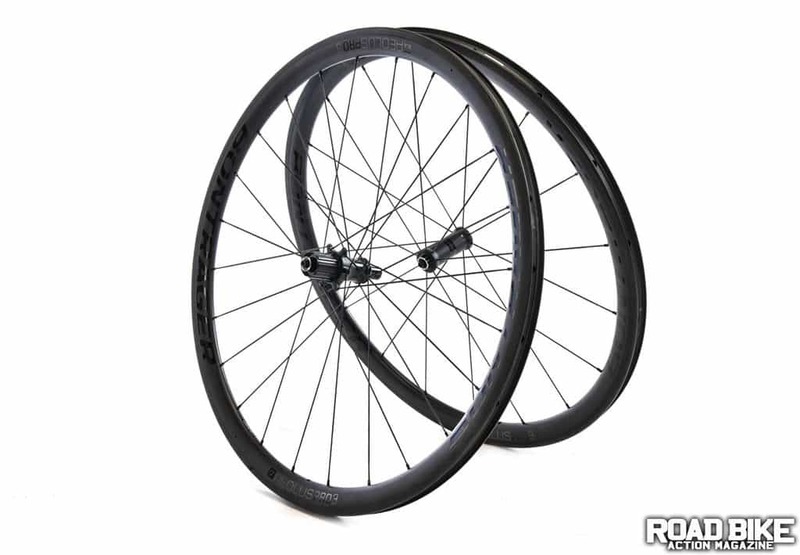 The wheel has a 35mm-deep carbon clincher that is tubeless compatible. The use of OCLV Pro carbon offers an optimized blend of weight, strength and durability with an internal width of the 19.5mm and an exterior width of 27mm. The wheels come laced using DT Aerolite straight-pull spokes to Bontrager-branded hubs, while the rear features a 24-point engagement and three-pawl hub that fits 10/11-speed cassettes. The wheels weighed in at 1562 grams using 24 spokes in the rear with 18 up front. The wheels come with both traditional rim strips and the full tubeless setup, including valves, tubeless strips and valve-core remover tool. The Irwin ICW-38C is 38mm deep and features a hand-laced build in Irvine, California. The rim has an internal width of 18mm with an external width of 26mm. Irwin has chosen to lace the wheelset using Sapim CX-Ray J-bend spokes to their self-branded hubs that have ceramic bearings. The wheelset weighed in at 1509 grams, with 24 spokes in the rear and 20 spokes up front. an external measurement of 27mm. The wheels feature their patented Paired Spokes technology, allowing them to use 16 spokes front and rear. They use CX Speed bladed spokes laced to their new TdF5.5 hub set with a titanium freehub body, T2 high-engagement mechanism and Enduro Zer0 ceramic hub-shell bearings. Already light at 1436 grams, Rolf Prima offers many upgrade options that can bring that down even more. The test rig we chose was the perfect candidate for the wheel swap, as its retail price was under $2000, and we lost up to 2 pounds right off the bat. This change was noticeable with only the first pedal stroke on each wheelset. The bike’s overall handling significantly benefited too. All three wheels were a big upgrade from the stock wheel offering with many features that aren’t commonly found on many bikes under $2000. The Bontrager and the Irwin wheels felt very similar during accelerations and decelerations. The Bontrager also felt a bit more supple during impacts and rough road, but the Irwin felt a bit quicker out of turns. The Rolf Prima was in a league of its own during this test in all facets. They felt light and lively, with a noticeable weight advantage during accelerations and decelerations. The braking on all three was about the same, but we didn’t have many extended braking opportunities. The Rolf held the corners tight with stunning stiffness. Thanks to the wide profile of all the rims, our 25mm tires were perfectly at home with 90 psi for our 155-pound test riders. One of the most noticeable differences was the engagement of the rear hub on the Irwin and the Rolf. They seem to lock in immediately, which resulted in a very secure and lossless feeling through the drivetrain that the Bontrager and stock wheels were missing. save the cash while helping your ride experience too.